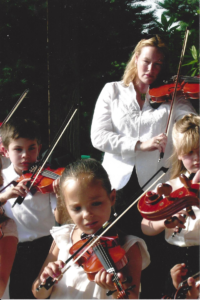 Tina Gant teaches violin lessons and group classes at the Suzuki Music Institute. She teaches all ages. Children as young as 3 and as old as 18 study with her. 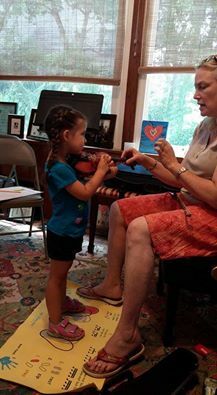 Highly regarded, Tina is certified by the Suzuki Association of the Americas to teach the Suzuki violin method through Book 9. Additionally, she participated in master classes with Dr. Suzuki, the founder of the Suzuki Method. She is a graduate of the esteemed Eastman School of Music (Rochester, NY) and the New England Conservatory of Music (Boston, MA). A performer with the Cleveland Pops Orchestra, Bach Festival of Florida, Florida Lyric Opera and Disney Epcot, she plays violin and piano duos with her husband regularly throughout the United States. She integrates ear training, technique, note reading and performance into her teaching. Tina is a nurturing fun teacher that inspires her students. Through encouragement and discipline, she brings out the best in each student. Ultimately, her goal is to develop the lifelong appreciation of music in addition to performance excellence. Because performance is an important part of a student’s development, her students participate in the Junior Festival sponsored by the National Federation of Music Clubs. In addition, the Suzuki Music Institute has recitals three times a year. Lastly, Suzuki students are encouraged to play as a group in community outreach events at assisted living facilities and community festivals. In addition to weekly private lessons, group classes are held and students are encouraged to attend. In a group setting, students learn from each other and are inspired. Performance classes produce students that are confident and accelerates student learning. Group classes prepare students for orchestra and chamber music. For over 35 years, the Suzuki Music Institute has developed the musical talents of students. Located at 351 Lake Avenue in Maitland, FL, The Suzuki Music Institute is accessible from I-4 and 17-92. Interested in providing your child with violin, viola, cello or piano instruction? We invite you to meet with us and have your child try an instrument. Sign up for an interview to learn more.